Meet the new love of my life, my nephew. Nothing more poetic than a beautiful baby. Mom, dad and baby are all doing really well. My nephew has a freakishly striking resemblance to my father, who died in 2007. 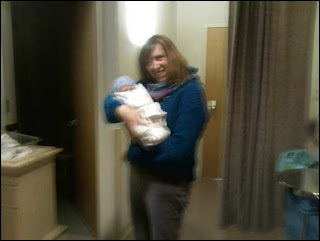 I said my mom felt like Cate Blanchett in the end of Benjamin Button when she held him. That's all I have to say. It's awesome being and aunt. I love love love babies.